This weekend I got linked into a tweetstorm regarding a tool called Set Timer Resolution by one Lucas Hale. People are claiming that using this tool results in better hit accuracy, faster responsiveness and higher frame-rates for King of the Kill and other Daybreak titles. It looks like other people have said that this helps, and at one point it looks like the download link was removed from the site. At the time of this writing, Download 3K is apparently a valid mirror (MD5: 4b3bccdb3bcbd48162aa77270d910276). I cannot recommend using any specific third-party applications, including this one. Your mileage may vary and incorrect use of software may cause issues. This specific very simple app (only 32k in size!) does not affect the game in any way shape or form. In fact, it was originally authored back in 2007, way before King of the Kill. Instead, it tells Windows to check it's timers more often. That's it. Imagine this. You need to do something in 30 seconds, but you only have a clock with a minute hand. You glance at the clock and it says 4:59 pm. Once it changes to 5:00 pm, has 30 seconds elapsed? Not necessarily! What if you glanced at the clock a mere second before it changed? To ensure that a full 30 seconds has elapsed you would actually have to wait until 5:01 pm to guarantee that at least 30 seconds has passed, but up to 1 minute 59 seconds could have passed! This is the nature of resolution: how often you can check the clock and it will tell you a different value. Now, computers do things a LOT faster than even once a second. Computers can do things in the nanosecond range (1/1,000,000,000 of a second) or even faster! When I started up the Windows 10 machine that I'm writing this post with, the resolution was 15.625 milliseconds (~0.015 sec). That's WAY slower than 0.000000001 sec! In fact, that resolution will only check the clock 64 times per second, which can be slower than some frame rates that people get when playing King of the Kill. When we do windows programming, when we set a timer or tell a thread to sleep, we specify values in milliseconds (1/1,000 sec), but if it's only checking the clock every 15.625 milliseconds, a 1 millisecond timer can end up waiting 15.625 milliseconds, which is more than a whole frame in some cases. Obviously we want Windows to check the clock much faster than 15.625 milliseconds. This is about how often I check my phone. And I always forget to check the time. At first I thought this tool might have some confirmation bias behind it, but after digging into it, i'm going to say that it's plausible that it has a positive effect on gameplay. Windows has but one internal timer, and it's shared by everything running on the system. When Daybreak titles start up, we tell Windows that we want 1 millisecond resolution on the system timer. But, to be good software citizens, we tell Windows to set the timer resolution back to what it was when the game is ending. Seems reasonable, right? Now imagine that everything does that. Say you start up Some App(tm) that sets the timer resolution from 15 ms to 1 ms, then you start up King of the Kill that also tries to set it to 1 ms. However, then you shut down Some App. Thinking that it's a good software citizen also, it sets the timer back to 15 ms. But you're still playing King of the Kill! Now you might see some different behaviors, like getting micro-stutters, and miss hits that should have landed, etc. The game is doing what it's supposed to, but something happened that it didn't expect: the system timer got set back to low resolution. The Set Resolution Timer tool doesn't appear to continually update the Current Resolution display, but I believe it will try periodically to make sure the system timer is at the selected resolution. EDIT: Lucas Hale (the author of SetTimerResolution) commented below to let me know that this assumption is invalid. It appears that Windows will take the maximum resolution requested by any running application. So if the game client requests 1ms resolution, and SetTimerResolution requests 0.5ms resolution, it will take the latter. This is good as it makes the devs' lives easier! 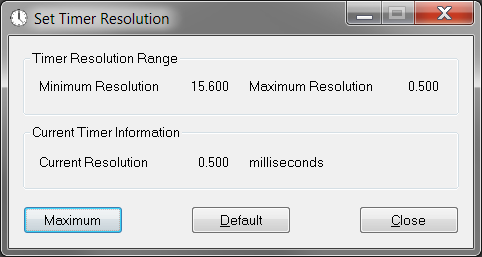 How does Set Timer Resolution work? This section is not for the technically faint-at-heart. I'm going to wax programmatically on you. First of all, when the game starts up, we call a documented function called timeBeginPeriod with the minimum value reported by the timeGetDevCaps function (generally 1 [millisecond]). This would probably work fine in many cases as long as our game is the only thing running on the machine. But that is never the case. Little programs that do behind-the-scenes things can start and end and do all sorts of stuff. Browsers can be running with multiple tabs open. Streamer software. Video recording software. Etc. If any of those things can affect the system timer while the game is running, then bad things happen. It looks like Set Timer Resolution goes even deeper than the multimedia functions (like timeBeginPeriod) that our titles are calling. It goes straight to the kernel, the heart of every operating system. It looks like it's calling some undocumented user-mode kernel functions: NtQueryTimerResolution and NtSetTimerResolution. These are likely called deeper down from the multimedia functions that our titles use. I'd like to make Set Timer Resolution completely unnecessary. Since the game is already trying to set the timer resolution at startup, it seems like we could be doing a better job of making sure it stays set. I'll evaluate this against our current priorities and talk with the team about getting this in an upcoming hotfix. I like the explanation using minute hands on a clock, I might have to start using that! Sometimes the site will go down under heavy load which happens from time to time. 2. The request for the resolution, it is a very nice API from Microsoft which does not need to be cleaned up on exit of each process - MS takes care of it for you. Also if a different applications requests a different timer resolution the kernel will selected the the smallest requested value from the running processes. If that process exits then the next lowest will be selected. There is no need to call the function more than once per process. I wish all the APIs were as clean as this. Now you've mentioned that you already set the timer to 1ms, so which does TimerResolution make a difference? Well it should make no difference if it also sets the timer to 1ms but if it sets the timer to 0.5ms then it will make a difference. It will not just improve the responsiveness of your app but also the OS itself. The task scheduler will check quantums more frequently, buffers will be flused, drivers will handle events etc. This all comes at a cost of more energy consumption and therefore more thermal load and shorter battery life. Lucas, thanks for commenting! I tried once again to download the utility from the site (the link given is http://www.lucashale.com/timerresolution/TimerResolution.zip) to no avail. Nice to hear that it already selects the minimum time value specified by all processes. That will make it much easier. Great discussion..I would like to offer this.. This is a slow motion clip from earlier today while using the app @ .5ms.. In this clip you will see 2 shots fired on target close range that do not register. I am sure the res timer app is very well written and does exactly what it is supposed to do. I am also sure it has no impact on bullet registration in KOTK. Would love some feedback from either of you..